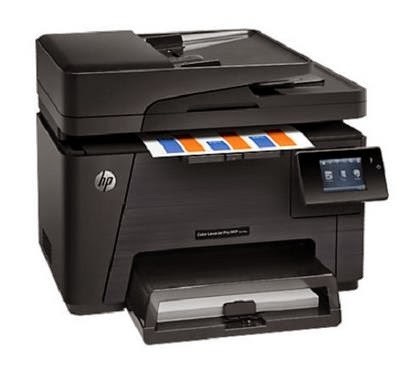 HP Color LaserJet Pro MFP M177fw Driver Download - The MFP M177fw is one variant of HP multifunction laser printers are suitable for use either at home or office because it supports a multifunctional capability. This laser printer can be used to print documents, scanned documents, copy, and send the documents via fax. HP Color LaserJet Pro M177fw can print documents at speeds of 16 ppm for black-white and 4 ppm for color. For document scanning needs, this laser printer can scan documents with a resolution up to 1200 dpi and save it in JPG, RAW (BMP), PDF, TIFF, and PNG. In addition, for the needs of photocopying, laser printer can copy documents at speeds of 16 cpm for black-white documents and 4 cpm for color documents. You also can send documents via fax with 33.6 Kbps data transfer speeds. Set the prints, copies, scans, and send faxes will be easier because this machine has a touch screen measuring 7.6 cm which makes you able to access the menu and a variety of settings at the touch of a finger. HP Color LaserJet Pro M177fw not only designed to work quickly and multifunctional, but also can save power consumption. This printer provides the features of the HP Auto-On / Auto-Off Technology which can turn the printer into sleep mode when not in use. In addition there are features Instant-On Technology that can make direct printer to work despite being is in sleep mode. HP Color LaserJet Pro M177fw uses 290 watts of electrical power for printing, 200 watts to copy, 9.2 watts for stand-by mode, 1.3 watts in sleep mode / Auto-Off, and 0.2 watts for Manual mode Off. Findprinterdrivers.com provide you the link HP Color LaserJet Pro MFP M177fw Driver Download for various operating system, the links download below is direct from HP official website. So, the link download is clean from malwares or viruses.